border: 1px solid #c7c7c7 alt= src=http://www.team-vip.se/images/flags/de.gif />dignitas/reptile has won The IndiWEB Painkiller Challenge #5 after defeating border: 1px solid #c7c7c7 alt= src=http://www.team-vip.se/images/flags/de.gif /> SK|Stelam in the Final this afternoon. border: 1px solid #c7c7c7 alt= src=http://www.team-vip.se/images/flags/de.gif />dignitas/reptile picks up 100 euros for the win and heads the rankings in the overall tournament. The grand final will have around 1250 euros in price money and will soon be played after the last (6th) qualifier. You could read a Post match interview with dignitas/reptile at team Dignitas site along with some other info regarding Indiweb PK Challenge. That’s it haha. I’ve been working on art, but I’m not going to include art in a public release until the map is done. So for now, you get the ugly version . I have no plans to change any gameplay elements on the map at this point. This is finalized gameplay unless something huge comes up, which I do not forsee. Hope you like it! Over on the CPLs website ( www.thecpl.com ), it has been announced that CPL Germany has been cancelled. The Cyberathlete Professional League (CPL) announced today that after careful consideration and extended discussions with its strategic partners and sponsors it has canceled the German World Tour stop. The CPL partners encountered critical logistical challenges with the proposed venue, and with the use of Painkiller (a Mature-rated game) in Germany. The CPL is in negotiations for a new stop in Europe that would take place after the United Kingdom stop, and before the end of the year. Competitors that had confirmed air travel for Germany and need special assistance should contact Scott Valencia immediately via email. More information about the new World Tour stop will be available at a later date. The CPL World Tour, the largest, first-ever, year-long competitive tour spotlighting the growing new sport of video game competitions, is primarily sponsored by Intel. Another leading sponsor of the World Tour is NVIDIA. Team Dignitas has once again put some effort in doing a nice interview for the Painkiller audience. This is the first time there is a non-gamer being interviewed for the famous Painkiller Spotlight. The honourable person being chosen for this is no other than Liuokin from TsN – Team Sportcast Network. He is one of the World Tour 2005 shoutcasters and have done an amazing job during all the stops he attended. If you would like to know more about him, painkiller, the world tour and his thoughts regarding the job as a shoutcaster you should definitely read this interview. What is the best thing about being a shoutcaster? Getting the opportunity to work with such amazing talent in a completely new field and being able to spearhead a totally new form of eSports entertainment. You become the link between the audience and the event making the average layman understand the game as if he were a seasoned veteran. That link you get with the audience is priceless. TSN have improved their coverage all the time and now starts to be and look a bit professional. From your point of view, what should and could be improved for future stops? The whole Dignitas PK Spotlight interview could be found here. If you have not read the other great painkiller spotlights go to www.team-dignitas.com and go to news archive and select Painkiller Spotlights and you will get all of them. The Team Sportscast Network is proud to announce the release of their first wave in a long series of videos that recap the Cyberathlete Professional League’s 2005 Extreme Summer Championships that took place in Dallas, Texas. Relive some of the best moments from the event as TsN takes you on a video roller coaster featuring such great hits as: “The finals for CS:S, CS 1.6 and Painkiller”, “The sponsor booth tours”, “The dead air stare”, “The elevator of Azeroth”, and more! The Downloads tab on the TsN web site also marks the return of TsN’s Content on Demand system which will allow visitors the ability to watch pre-recorded video coverage and listen to audio commentary from past matches and events. Brian Kennedy, CIO, Team Sportscast Network, L.L.C. After the CPL WT USA event I had the opportunity to interview the new gaming talent Dj from team check-six. Dj managed to place 9-12th in this tournament which is his best achievement so far. In this Painkiller Spotlight we talk about his progress, plans and his thoughts regarding the World Tour 2006. You have improved since day 1 of the World Tour, you think you could improve even more? And tell us about your goal with this World Tour? I feel that I have been improving on a consistent basis. I went into this event, thinking the top 5 or 6 players are untouchable but, after playing Stermy and Ztrider, I feel that if I keep practicing, I will be able to reach the level of play that they are on. Originally, at the beginning of the world tour, my main goal was to consistently place top 16 at the stops and to do so in the finals. After summer CPL, I feel I have the confidence and motivation to keep improving. Even though I realize top 6 is almost unattainable for me at the moment, I feel I will have plenty of chances to place at least top 12 at future stops. And a question that is asked everywhere but sure is interesting. Which games do you want to have for the World Tour 2006? I trust CPL has learned a lot from this first world tour and will definitely think twice about picking whichever game they choose. No matter what it is, I will try it. If I like it, I will balance school and gaming like I have been doing. If I don’t like it, I will instead try to concentrate on school for the year and get as far ahead as possible maybe even finish early, while i wait for the next big game. Personally, I hope the 1v1 game is quake 4. Even though I like 1v1 games better than team games, I will probably also give the Team game a try also. Tonight saw Fatal1ty winning the CPL WT USA stop after beating Vo0 twice on Sacred (12-11;26-16). Although Vo0 had a strong start on Sacred, the first game was very close with both players having the lead at various times, resulting in a one frag win for Fatal1ty. On the second map, Fatal1ty went on to push ahead 22-0 at one time, with Vo0 making a partial comeback. Fatal1ty is only the second player to beat Vo0 and win a CPL event; SteLam having previously won at CPL Spain. Kudos to TsN who provided excellent coverage of the event. Dallas, TX, July 03, 2005 –(PR.COM)– Serendipitous Films has chosen the US stop of the Cyberathlete® Professional League (CPL) World Tour to premier the first trailer of their latest feature, Bloodlines. Beginning on July 6th, the event will take place at the Gaylord Texan Resort in Grapevine, Texas. The Bloodlines trailer premier is scheduled at 8:30pm on Friday, July 8th, at the main CPL Summer Event stage hosted by Intel. Filmed in Fort Worth, Frisco, and Dallas, Texas, Bloodlines stars Lou Diamond Phillips (La Bamba, Young Guns, Courage Under Fire), Yancy Butler (Witchblade, Drop Zone), Tom Wright (Barbershop 1 and 2, Murder at 1600), Glenn Morshower (24, CSI, Black Hawk Down, Pearl Harbor), Jeff Speakman (The Perfect Weapon, The Gunman), and Dallas newcomer Troy Baker. The film also marks the acting debut for Angel Munoz, president of the CPL, who was cast as the Latin American corporate president taken hostage. The Bloodlines trailer premier should have quite an audience – online tickets to the Cyberathlete® Extreme Summer Championships have already sold out. A total of 7,300 gamers from 60 different countries registered online for the five-day CPL World Tour event, which will take place July 6th through July 10th in Grapevine, Texas. For information regarding Bloodlines and Serendipitous Films vist www.s-films.com. I noticed this over on the PCF website, which has always had very little content other than the usual self-congratulating platitudes. We find a news post called Its been a while, so its high time for some news. which is the most communication weve seen from the company for a long while. You can find the post here. Now that Painkiller expansion pack, Painkiller: Battle out of Hell, and Painkiller Gold/Black Edition are out, were totally focused on Painkiller Xbox (coming this year). Its hell of a challenge to squeeze that behemoth of a game into Xbox 64 MB, but weve already made a serious progress and even showed a playable demo behind this years E3 closed door. More news as soon as the release date is finalized. It does make you wonder whether these optimisations will ever make their way to the PC version of the game, or by the time that they do, whether it will matter. CHANGE: Minor alteration to rocketfix based on mass public testing. Tweaking now locked. ADD: \PitabotEnabled [1/0] | Cfg.PitabotEnabled – sets pitabot server component active/inactive. ADD: ammolisthideweapons [0/1] (Cfg.AmmolistHideWeapons = true/false) Hides missing weapons. ** NOTE: It will take up to 20 seconds for you to auth with a PK++ server, be patient! Once authed you will recieve stats and info in spec HUD. ADD: Locked down console – in version sent to CPL only. edit the contents at your own risk. NOTE: This mod version requires that you have the latest PK version installed. to PCFs oversight, so renaming of PKPlus.pak to LScripts.pak is required. you have what it takes please contact the ops in IRC: #painkiller.euro @ qnet. All content of this mod is © www.pkeuro.com. All rights Reserved. demos, movies, latest news and much much more. event. Also the company running the world tour. http://www.cplworldtour.com – The CPL World Tour website. DI-MeisterM for some of the map loading screens. Id software / OSP for some of the feature ideas. PKEURO.COM for hosting and assistance. Various testers for their help. B6 & PrimeviL for their coloured icons. All the players whove given feedback already. All other acknowledgements within game. welcome, and the best ones will be included in later packages. ADD: Option to remove NET from scoreboard? BUG: Two different sounds still play when weapon switching + firing. – Will look at. ADD: Make a hitsound for freezer for BOTH sides so you know if you hit someone and they know if theyve been hit. FIX: Low fps bug – Missile Controller Code? BUG: Shotgun secondary fire (Freezer) does NOT work. – Does anyone actually use this weapon? Perhaps in ProPlus it should inflict damage? NOTE: This mod requires that you have the latest PK version installed. options) for PK++ for Painkiller for both clients and the server console. Some features requires PK++ to be installed on server. NOTE: It will take up to 20 seconds for you to auth with a PK++ server, be patient! Once authed you will recieve stats and info in spec HUD. These features include rcon, referee, stats, spectator hud information. Rcon allows a client to type directly into the server console. This only happens if a rconpassword is set on the server, AND if the clients rconpassword matches the servers. To set an rcon password, edit the config.ini file and type in Cfg.RconPass = “”, if this is left blank (i.e. = “”), rcon is disabled. Alternatively type \rconpass directly into the server console whilst the server is running. where matches the server password exactly. But you will need to set your new password on the client immediately after. Referee works like rcon, except for two important differences. Firstly that the commands a referee uses can only be callvote-enabled commands, and secondly, a client can be made referee either by using a refereepassword, OR by being callvoted to referee status. To set an referee password, edit the config.ini file and type in Cfg.RefPass = “”, if this is left blank (i.e. = “”), referee is disabled. Alternatively type \refpass directly into the server console whilst the server is running. Alternatively, a referee status can be callvoted. For this, firstly the clientID is required. This can be found on client or server by typing the command: \players . This will return something like the following. Will callvote maniax to referee status. A referee password cannot be changed remotely unless the client uses rcon. addbot – Server only. Adds a bot to the server. addloc – Server only. Adds a location name. addwaypoint – Server only. Adds a waypoint. allowbrightskins – Server only. Toggles brightskins on/off. allowforwardrj – Server only. Toggles forward rocket jumping on/off. allready – Server only. Sets all players to ready. allunready – Server only. Sets all players to unready. altscoreboard – Client only. Toggles alternative scoreboard colours (on new scoreboard). ammolist – Client only. Toggles rendering of HUD ammolist. ammolisthideweapons – Client only. Toggles rendering of weapons in ammolist. autorecord – Client only. Toggles the automatic recording of matches. autoscreenshot – Client only. Toggles the automatic screenshot of final scoreboard. bankick – Server only. Kicks and bans a player from the server by specified name. bankickid – Server only. Kicks and bans a player from the server by specified clientID. benchmark – Client only. Performs a rendering benchmark test. bind – Client only. Binds a command to a key. botattack – Server only. Toggles whether bots will attack. botchat – Server only. Toggles whether bots talk. botminplayers – Server only. Specifies the number of player below which bots are added. botskill – Server only. Specifies the aiming skill level of the bot. 1-10.
break – Client only. Indicates you want to stop a match. breakmatch – Server only. Stops a match. brightskinenemy – Client only. Sets the brightskin colour of enemy players. brightskinteam – Client only. Sets the brightskin colour of team players. callvote – Client only. Calls a vote. camerainterpolateangle – Client only. Not used. camerainterpolateposition – Client only. Not used. camerainterpolation – Client only. Not used. camerapitch – Client only. Sets the camera pitch in spectator mode. camerayaw – Client only. Sets the camera yaw in spectator mode. capturelimit – Server only. Sets the capture limit for CTF. clientbandwidth – Client only. Sets the maximum upstream bandwidth. coloredicons – Client only. Toggles the rendering of coloured HUD icons. colouredicons – Client only. Toggles the rendering of coloured HUD icons. configuremapview – Client only. Toggles configure mode for mapview. connect – Client only. Connects to a specified IP. connectpktv – Client only. Not used. crosshair – Client only. Toggles the rendering of a crosshair. crosshairnames – Client only. Toggles the rendering of crosshair names. crosshairnamesteamonly – Client only. Toggles the whether crosshair names are shown for team only. deadbodyfix – Server only. Not used. demolist – Client only. Displays list of demos. demoplay – Client only. Plays a specified demo. demoplaybmp – Client only. Plays a specified demo and outputs screenshots for each frame. demorecord – Client only. Records a demo to a specified file name. demostop – Client only. Stops recording a demo. directinput – Client only. Toggles Direct Input. disablehud – Client only. Toggles rendering of HUD. disconnect – Client only. Disconnects from a server. enemyinterpolation – Client only. Toggles player interpolation (smoothing movement). exec – Both. Loads the settings from a specified config. exit – Both. Exits the game. fallingdamage – Server only. Toggles falling damage. fixedcolors – Client only. Toggles whether brightskins swap depending on your team. fixedcolours – Client only. Toggles whether brightskins swap depending on your team. forcejoin – Server only. Forces a specified clientID to join the game. forcespec – Server only. Toggles force spectator mode while game is playing. forcespectator – Server only. Forces a specified clientID to spectate. fov – Client only. Sets your Field Of Vision. fraglimit – Server only. Sets the fraglimit. freezerfix – Server only. Not used. gamemode – Server only. Sets the gamemode. get – Both. Returns the value of a config setting. hmrecord – Client only. Not used. hmtest – Client only. Not used. hudsize – Client only. Sets the size at which the HUD is rendered. impureclientwarning – Server only. Toggles whether impure clients are warned about in console publically. kick – Server only. Kicks the specified player by name. kickallbots – Server only. Kicks all the bots from the server. kickbot – Server only. Kicks the last bot to join the server. kickid – Server only Kicks the specified player by clientID. kill – Client only. Kills yourself. lmslives – Server only. Sets the LMS gamemode lives. logging – Both. Toggles whether console is logged to file. map – Server only. Changes to a specified map. maplist – Both. Lists the maps currently available. mapview – Client only. Toggles rendering of mapview overview in spectator mode. mapviewshowrespawns – Client only. Toggles the rendering of spawn locations in spectator mode (used for configuration). maxplayers – Server only. Sets the maximum number of players for a match. maxspectators – Server only. Sets the maximum number of spectators. motd – Server only. Sets the Message of the Day. msensitivity – Client only. Sets the mouse sensitivity. msmooth – Client only. Toggles mouse smoothing. name – Client only. Sets your player name. netstats – Client only. Toggles rendering of network statistics on HUD. Debug. netstatsavgfrom – Client only. Sets the number of frames from which to take the average for statistics. netstatsupdatedelay – Client only. Sets how often network statistics are updated on HUD. noblood – Client only. Toggles the rendering of blood effects. nodecals – Client only. Toggles the rendering of decals/ marks on walls. noexplosions – Client only. Toggles the rendering of explosions. noflames – Client only. Toggles the rendering of flames. nosmoke – Client only. Toggles the rendering of smoke. nospawneffects – Client only. Toggles the rendering of spawn effects. notready – Client only. Indicates you are not ready to start a match. oldscoreboard – Client only. Toggles the use of the old VPK scoreboard. overtime – Server only. Sets the amount of overtime in the event of a tied game. pitabotenabled – Server only. Toggles the use of advanced pitabot scorebot features. pkalwaysgib – Single player cheat. pkammo – Single player cheat. pkcards – Single player cheat. pkdemon – Single player cheat. pkgod – Single player cheat. pkgold – Single player cheat. pkhaste – Single player cheat. pkhealth – Single player cheat. pkkeepbodies – Single player cheat. pkkeepdecals – Single player cheat. pkpower – Single player cheat. pkweakenemies – Single player cheat. pkweaponmodifier – Single player cheat. pkweapons – Single player cheat. playdemo – Client only. Plays a demo from the specified file name. players – Both. Lists clientIDs against player names. powerupdrop – Server only. Toggles whether power ups are dropped on kill. powerups – Server only. Toggles use of power ups. print – Both. Prints a message to the console. printstatsall – Both. Prints all weapon statistics for all players. proplus – Server only. Toggles proplus settings. quit – Both. Quits the game. rcon – Client only. Sends specified command via rcon. rconpass – Both. Sets the rcon password. ready – Client only. Indicates you are ready to play a match. reconnect – Client only. Reconnects to last IP. recorddemo – Client only. Records a demo to a specified file name. ref – Client only. Sends a specified command via ref. refpass – Both. Sets the referee password. reloadmap – Server only. Reloads the current map. reloadwaypoints – Server only. Reloads the bot waypoints for the current map. restartmap – Server only. Restarts the current map. rocketexplosionstrength – Server only. Not used. rocketfactor – Server only. Not used. rocketfactororder – Server only. Not used. rocketfix – Server only. Toggles the use of PK++ rocketfix. rocketlogging – Server only. Not used. rot – Server only. Debug. saferespawn – Server only. Toggles spawn telefragging safety. say – Both. Broadcasts a say to all. scoreboardfontsize – Client only. Changes the font size for the scoreboard. scoreboardshowpacketloss – Client only. Toggles the rendering of packetloss in the scoreboard. server – Client only. Not used. serverframerate – Client only. Sets the number of frames which the client wishes to receive per second. serverinfo – Both. Shows the server information. serverpassword – Server only. Sets server password. set – Both. Sets a config value to a specified string. setn – Both. Sets a config value to a specified number. sets – Both. Sets a config value to a specified string. showpingx – Client only. Sets fraction of screen width for ping to be rendered. showpingy – Client only. Sets fraction of screen height for ping to be rendered. showtimer – Client only. Toggles the rendering of timer in HUD. showtimercountup – Client only. Toggles whether timer should count up/down. showtimerfontsize – Client only. Sets the font size for the timer. showtimerx – Client only. Sets the fraction of screen width for timer to be rendering. showtimery – Client only. Sets the fraction of screen height for timer to be rendering. showweapon – Client only. Toggles the rendering of the gun. simplehud – Client only. Toggles whether the simplified HUD should be used. spectator – Client only. Toggles the desired spectator/non-spectator mode. speedmeter – Client only. Toggles the rendering of a speedmeter. startupweapon – Server only. Sets the respawn weapon. stats – Both. Displays weapon statistics. statsall – Both. Displays weapon statistics. statsdump – Both. Displays weapon statistics and writes to file. stresstest – Client only. Performs stress test. team – Client only. Indicates a team r/b. teamdamage – Server only. Toggles whether damage is received from teammates. teamlock – Server only. Toggles whether a team is locked during a game. teamoverlay – Client only. Toggles rendering of team overlay in HUD. teamoverlayfontsize – Client only. Sets the font size for the team overlay. teamoverlayw – Client only. Sets the width of the team overlay. teamoverlayx – Client only. Sets the fraction of the screen width for the team overlay to be displayed. teamoverlayy – Client only. Sets the fraction of the screen height for the team overlay to be displayed. teamsay – Client only. Says a message to teammates. teamscores – Client only. Toggles the rendering of teamscores in HUD. teamscoresfontsize – Client only. Sets the font size for teamscores. teamscoresshadow – Client only. Toggles the rendering of shadow for teamscores text. teamscoresx – Client only. Sets the fraction of screen width for teamscores to be rendered. teamscoresy – Client only. Sets the fraction of screen height for teamscores to be rendered. time – Client only. Displays the local time. timedemo – Client only. Plays a demo at timed speed. timelimit – Server only. Sets the timelimit. toggleconsole – Client only. Toggles the console open/closed. version – Both. Displays the current PK++ version. vote – Client only. Vote for yes or no, as specified. warmupdamage – Server only. Toggles damage during warmup. weaponprediction – Client only. Not used. weaponrespawntime – Server only. Sets the weapon respawn time. weaponspecular – Client only. Toggles weapon specular. weaponsstay – Server only. Toggles whether weapons stay after pickup. where – Client only. Debug. writeconfig – Both. Writes all settings to a config with the specified name. Cfg.Admin – Server only. Sets the admin name which is displayed in a server poll. Cfg.AllowBrightskins – Server only. Sets whether brightskins are used. Cfg.AllowBunnyhopping – Server only. Sets whether bunnyhopping is allowed. Cfg.AllowForwardRJ – Server only. Sets whether forward rocket jumping is allowed. Cfg.AltScoreboard – Client only. Sets whether alternative scoreboard is used. Cfg.AmbientSounds – Client only. Sets whether ambient sounds are played. Cfg.AmbientVolume – Client only. Sets sound volume. Cfg.AmmolistHideWeapons – Client only. Sets whether weapons are displayed in ammolist. Cfg.AutoChangeWeapon – Client only. Sets whether weapons are switched to on pickup. Cfg.AutoScreenshot – Client only. Sets whether a screenshot is taken at the end of a game. Cfg.AutoStatsDump – Both. Sets whether stats are logged to file at match end. Cfg.AutoTeamLock – Server only. Sets whether teams are locked during games. Cfg.Autorecord – Client only. Sets whether demos are automatically recorded. Cfg.BestExplosives – Client only. Sets which weapons are the best for best explosive key. Cfg.BestNonExplosives – Client only. Sets which weapons are the best for best non-explosive key. Cfg.BestWeapons1 – Client only. Sets which weapons are the best for bestweapon1 key. Cfg.BestWeapons2 – Client only. Sets which weapons are the best for bestweapon2 key. Cfg.BlackEdition – Both. Indicates whether the game is blackedition. Cfg.Bloom – Client only. Sets whether bloom rendering is used. Cfg.BotAttack – Server only. Sets whether bots attack. Cfg.BotChat – Server only. Sets whether bots chat. Cfg.BotCheckStubNose – Server only. Sets whether bots will stub their noses. Ow! Cfg.BotEliza – Server only. Sets whether bots respond using Eliza-based code to things you say. Cfg.BotFakePing – Server only. Sets whether bots have a fake ping. Cfg.BotFindItems – Server only. Sets whether bots notice items nearby. Cfg.BotMinPlayers – Server only. Sets the number of players on a server below which bots are added. Cfg.BotNames – Server only. Sets the array of random bot names. Cfg.BotQuickRespawn – Server only. Sets whether bots respawn quickly or not. Cfg.BotSkill – Server only. Sets the aiming skill of the bots. Cfg.BotTaunts – Server only. Sets the comments the bots make randomly during gameplay. Cfg.Brightness – Client only. Sets the rendering brightness. Cfg.BrightskinEnemy – Client only. Sets the enemy brightskin colour. Or red team with fixed colours on. Cfg.BrightskinTeam – Client only. Sets the team brightskin colour. Or blue team with fixed colours on. Cfg.CameraInterpolateAngle – Client only. Not used. Cfg.CameraInterpolatePosition – Client only. Not used. Cfg.CameraInterpolation – Client only. Not used. Cfg.CaptureLimit – Server only. Sets the CTF capture limit. Cfg.CharacterShadow – Client only. Sets whether the player has a shadow or not. Cfg.ClientConsoleLockdown – Server only. Sets whether clients consoles are locked or not. Cfg.ClipPlane – Client only. Sets the rendering clip plane. Cfg.ColouredIcons – Client only. Sets whether coloured icons are used or not. Cfg.ConfigMapView – Client only. Sets whether mapview is in configure mode. Cfg.ConnectionSpeed – Client only. Sets the network connection speed settings. Cfg.Contrast – Client only. Sets the rendering contrast. Cfg.Coronas – Client only. Sets whether coronas are rendered. Cfg.Credits – Client only. Sets the credits information. Cfg.Crosshair – Client only. Sets the crosshair used. Cfg.CrosshairB – Client only. Sets the blue value of the crosshair colour. Cfg.CrosshairG – Client only. Sets the green value of the crosshair colour. Cfg.CrosshairNames – Client only. Sets whether crosshair names are rendered or not. Cfg.CrosshairNamesDisableInDuel – Client only. Sets whether crosshair names are shown in duel. Cfg.CrosshairNamesTeamOnly – Client only. Sets whether crosshair names are only shown for teammates. Cfg.CrosshairR – Client only. Sets the red value of the crosshair colour. Cfg.CrosshairSize – Client only. Sets the size of the crosshair. Cfg.CrosshairTrans – Client only. Sets the transparency of the crosshair. Cfg.CustomCrosshairLocation – Client only. Sets whether the crosshair is rendered at a custom location. Cfg.Decals – Client only. Sets the level of decal rendering. Cfg.DecalsStayTime – Client only. Sets the decal stay time. Cfg.DedicatedServer – Both. Not used. Cfg.DetailTextures – Client only. Sets the rendering detail level for textures. Cfg.DisableHud – Client only. Sets whether HUD is disabled or not. Cfg.DisableMOTDRendering – Client only. Sets whether MOTD is rendered or not. Cfg.DisturbSound3DFreq – Client only. Sets the sound frequency for 3D sounds. Cfg.DuelQueue – Server only. Sets whether duel queue is being used. Cfg.DynamicLights – Client only. Sets whether dynamic lights are used. Cfg.EAXAcoustics – Client only. Sets whether acoustics are used. Cfg.Email – Server only. Sets the email information for server poll. Cfg.FOV – Client only. Sets the Field of Vision. Cfg.FPS – Client only. Not used. Cfg.FallingDamage – Server only. Sets whether falling damage is on or off. Cfg.FixedColors – Client only. Sets whether brightskins are based on teams. Cfg.ForceModel – Server only. Sets whether client models are forced or not. Cfg.ForceSpec – Server only. Sets whether new comers are forced to spec on join. Cfg.FragLimit – Server only. Sets the fraglimit. Cfg.Fullscreen – Both. Not used. Cfg.GameMode – Server only. Sets the default gamemode. Cfg.Gamma – Client only. Sets the gamma level. Cfg.GraphicsQuality – Client only. Sets the graphics level. Cfg.HUDSize – Client only. Sets the HUD size. Cfg.HUDTransparency – Client only. Sets the HUD transparency. Cfg.HUD_AmmoList – Client only. Sets whether the ammo list is on or not. Cfg.HUD_CurrentWeapon_Icon – Client only. Sets whether the current weapon icon is rendered. Cfg.HUD_FragMessage – Client only. Sets whetehr frag messages are shown on the HUD. Cfg.HeadBob – Client only. Sets the amount of head bobbing. Cfg.ImpureClientWarning – Server only. Sets whether public warnings of impure clients is used. Cfg.InvertMouse – Client only. Sets whether the mouse is inverted or not. Cfg.ItemRespawnFix – Server only. Sets whether PK++ item respawn fix is used or not. Cfg.LMSLives – Server only. Sets the LMS lives. Cfg.Language – Both. Sets the language being used. Cfg.LimitServerFPS – Server only. Sets whether the server FPS is limited or not. Not used. Cfg.Location – Server only. Sets the server location for server poll. Cfg.Logfile – Both. Sets the console logging file name. Cfg.LogfileDaily – Both. Sets whether logging is by day or not. Cfg.Logging – Both. Sets whether console logging is on or not. Cfg.LowQualityMultiplayerSFX – Client only. Sets whether low mp gfx is used or not. Cfg.MOTD – Server only. Sets Message of the Day. Cfg.ManualIP – Client only. Sets the default connect to IP. Cfg.MapViewShowRespawns – Client only. Sets whether mapview shows respawns or not. Cfg.MasterVolume – Client only. Sets the master sound volume. Cfg.MaxFpsMP – Client only. Sets the maximum framerate. Cfg.MaxPlayers – Server only. Sets the maximum number of players. Cfg.MaxSpectators – Server only. Sets the maximum number of spectators. Cfg.MessagesKeys – Client only. Sets pre-defined messages. Cfg.MessagesSayAll – Client only. Sets pre-defined messages. Cfg.MessagesTexts – Client only. Sets pre-defined messages. Cfg.ModName – Server only. Sets the mod name being used. For server poll. Cfg.MouseSensitivity – Client only. Sets the mouse sensitivity. Cfg.Multisample – Client only. Sets whether textures are aliased or not. Cfg.MusicVolume – Client only. Sets the music volume. Cfg.NetcodeEnemyPredictionInterpolation – Client only. Sets player interpolation (movement smoothing). Cfg.NetcodeEnemyPredictionInterpolationFactor – Client only. Sets the amount of interpolation. Cfg.NetcodeMaxPlayerActionsPassed – Client only. Sets the queue size before reliable data is sent. Cfg.NetcodeMinUpstreamFrameSize – Client only. Sets the minimum upstream packet size. Cfg.NetcodeServerFramerate – Client only. Sets the maximum number of frames to be received. Cfg.NetcodeStatsNumberToAverageFrom – Client only. Debug. Cfg.NetcodeStatsUpdateDelay – Client only. Debug. Cfg.NetworkInterface – Both. Sets the network interface IP. Cfg.Newhitsound – Client only. Sets whether the newer PK++ hitsound is used or not. Cfg.NoAmmoSwitch – Client only. Sets whether weapons are changed to with no ammo. Cfg.NoBlood – Client only. Sets whether blood is rendered. Cfg.NoExplosions – Client only. Sets whether explosions rendered. Cfg.NoFlames – Client only. Sets whether flames are rendered. Cfg.NoGibs – Client only. Sets whether gibs are rendered. Cfg.NoSmoke – Client only. Sets whether smoke is rendered. Cfg.NoSpawnEffects – Client only. Sets whether spawn effects are rendered. Cfg.NoWarmup – Server only. Sets whether there is a warmup mode. Cfg.OldScoreboard – Client only. Sets whether the old VPK scoreboard is used. Cfg.Overtime – Server only. Sets the amount of overtime for a tied match. Cfg.PKTV – Server only. Not used. Cfg.PKTVDelay – Server only. Not used. Cfg.PKTVFps – Server only. Not used. Cfg.PKTVPassword – Server only. Not used. Cfg.ParticlesDetail – Client only. Sets the amount of particle detail. Cfg.PiTaBOT – Server only. Sets whether advanced pitabot is loaded or not. Cfg.PitabotEnabled – Server only. Sets whether to load advanced pitabot. Cfg.PlayerModel – Both. Sets the player model to be used. Cfg.PlayerName – Client only. Sets the name. Cfg.PowerupDrop – Server only. Sets whether power ups are dropped. Cfg.Powerups – Server only. Sets whether power ups are used. Cfg.PrecacheData – Both. Sets whether data is precached. Cfg.ProPlus – Server only. Sets whether proplus settings are used. Cfg.Projectors – Client only. Sets whether projector rendering is used. Cfg.PublicServer – Server only. Sets whether it is public or not. Cfg.PureScripts – Server only. Sets whether only paks are used. Cfg.RconPass – Both. Sets the rcon password. Cfg.RefPass – Both. Sets the ref password. Cfg.RenderSky – Client only. Sets rendering of the sky. Cfg.Resolution – Client only. Sets the rendering resolution. Cfg.RestartMaps – Server only. Sets whether maps are restarted or not. Cfg.ReverseStereo – Client only. Sets whether stereo is reversed. Cfg.RocketFix – Server only. Sets whether PK++ rocketfix is on or not. Cfg.RocketLogging – Both. Not used. Cfg.RocketsFromGun – Client only. Not used. Cfg.SafeRespawn – Server only. Sets whether telefragginf from spawns is on safe or not. Cfg.ScoreboardFontSize – Client only. Sets scoreboard font size. Cfg.ScoreboardShowPacketLoss – Client only. Sets whether packet loss is shown on scoreboard. Cfg.ServerFPS – Server only. Sets server FPS. Not used? Cfg.ServerMaps – Server only. Sets default maps. Cfg.ServerMapsCLA – Server only. Sets default maps. Cfg.ServerMapsCTF – Server only. Sets default maps. Cfg.ServerMapsDUE – Server only. Sets default maps. Cfg.ServerMapsFFA – Server only. Sets default maps. Cfg.ServerMapsLMS – Server only. Sets default maps. Cfg.ServerMapsPCF – Server only. Sets default maps. Cfg.ServerMapsTDM – Server only. Sets default maps. Cfg.ServerMapsTLB – Server only. Sets default maps. Cfg.ServerMapsVSH – Server only. Sets default maps. Cfg.ServerName – Server only. Sets server name for server poll. Cfg.ServerPassword – Server only. Sets server password. Cfg.ServerPort – Server only. Sets server port. Cfg.SfxVolume – Client only. Sets sound effects volume. Cfg.Shadows – Client only. Sets rendering of shadows. Cfg.ShowDaydreamWarning – Client only. Not used. Cfg.ShowFPSShadow – Client only. Sets shadow on showfps. Cfg.ShowPing – Client only. Sets showping rendering. Cfg.ShowPingShadow – Client only. Sets showping shadow. Cfg.ShowTimer – Client only. Sets timer rendering. Cfg.ShowTimerCountUp – Client only. Sets timer count up/down. Cfg.ShowTimerFontSize – Client only. Sets timer font size. Cfg.ShowTimerShadow – Client only. Sets timer shadow. Cfg.Simplehud – Client only. Sets whether simple HUD is used. Cfg.SmoothMouse – Client only. Sets whether mouse input is smoothed. Cfg.SoundFalloffSpeed – Client only. Sets amount of sound degradation. Cfg.SoundProvider3D – Client only. Sets sound driver. Cfg.SoundQuality – Client only. Sets sound quality. Cfg.SpeakersSetup – Client only. Sets speaker set up. Cfg.StartupWeapon – Server only. Sets respawn weapon. Cfg.StopMatchOnTeamQuit – Server only Sets whether a match should stop when one team leaves. Cfg.SwitchFire – Client only. Sets whether firing modes 1/2 are switched. Cfg.Team – Client only. Sets team. Cfg.TeamDamage – Server only. Sets whether team damage is on. Cfg.TeamOverlay – Client only. Sets whether teamoverlay is on. Cfg.TeamOverlayFontSize – Client only. Sets font size for teamoverlay. Cfg.TeamOverlayX – Client only. Sets fraction of screen width for teamoverlay. Cfg.TeamOverlayY – Client only. Sets fraction of screen height for teamoverlay. Cfg.TeamScores – Client only. Sets whether teamscores is rendered. Cfg.TeamScoresFontSize – Client only. Sets font size for teamscores. Cfg.TeamScoresShadow – Client only Sets whether font shadow is on for teamscores. Cfg.TextureFiltering – Client only. Sets whether textures are filtered. Cfg.TextureQuality – Client only. Sets texture quality. Cfg.TextureQualityArchitecture – Client only. Sets texture quality. Cfg.TextureQualityCharacters – Client only. Sets texture quality. Cfg.TextureQualitySkies – Client only. Sets texture quality. Cfg.TextureQualityWeapons – Client only. Sets texture quality. Cfg.TimeLimit – Server only. Sets timelimit. Cfg.TournamentSettings – Client only. Sets whether console is disabled. Cfg.URL – Server only. Sets URL for server poll. Cfg.UserAllowBrightskins – Server only. Callvote enable flag. Cfg.UserAllowBunnyhopping – Server only. Callvote enable flag. Cfg.UserAllowForwardRJ – Server only. Callvote enable flag. Cfg.UserBankick – Server only. Callvote enable flag. Cfg.UserCaptureLimit – Server only. Callvote enable flag. Cfg.UserFragLimit – Server only. Callvote enable flag. Cfg.UserGameMode – Server only. Callvote enable flag. Cfg.UserKick – Server only. Callvote enable flag. Cfg.UserLMSLives – Server only. Callvote enable flag. Cfg.UserMapChange – Server only. Callvote enable flag. Cfg.UserMaxPlayers – Server only. Callvote enable flag. Cfg.UserMaxSpectators – Server only. Callvote enable flag. Cfg.UserPowerupDrop – Server only. Callvote enable flag. Cfg.UserPowerups – Server only. Callvote enable flag. Cfg.UserReloadMap – Server only. Callvote enable flag. Cfg.UserStartupWeapon – Server only. Callvote enable flag. Cfg.UserTeamDamage – Server only. Callvote enable flag. Cfg.UserTimeLimit – Server only. Callvote enable flag. Cfg.UserWeaponRespawnTime – Server only. Callvote enable flag. Cfg.UserWeaponsStay – Server only. Callvote enable flag. Cfg.ViewWeaponModel – Client only. Sets whether the gun model is shown. Cfg.WarmUpTime – Server only. Sets the amount of warmup time. Cfg.WarmupDamage – Server only. Sets whether there is damage in warmup. Cfg.WarpEffects – Client only. Sets whether warp effects are rendered. Cfg.WaterFX – Client only. Sets how water effects are rendered. Cfg.WeaponBob – Client only. Sets whether the gun bobs as you walk. Cfg.WeaponNormalMap – Client only. 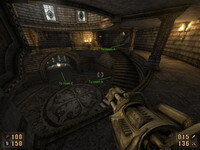 Sets whether the gun uses a normal map. Cfg.WeaponPrediction – Client only. Sets whether weapon prediction is on. Cfg.WeaponPriority – Client only. Sets how guns are selected. Cfg.WeaponRespawnTime – Server only. Sets the respawn time for weapons. Cfg.WeaponSpecular – Client only. Sets specular rendering. Cfg.WeaponsStay – Server only. Sets whether weapons remain after pickup. Cfg.WeatherEffects – Client only. Sets whether weather effects are on. Cfg.WheelSensitivity – Client only. Sets the sensitivity of the mouse wheel. Cfg.ZoomFOV – Client only. Sets the zoom fov for bolt gun. Cfg.overtime – Server only. Not used. before which bots are added. spectators to join the game. TO NOTE: Rocket jumping, rocket behaviour, movement and other core gameplay features have not been touched outside of ProPlus mode. ProPlus constitutes a purely community-driven adaption of PK gameplay. In this document, the reasons and details of what was changed and why is discussed. It is clear that both 1.5 and 1.62 are against the design intents or ideals of PCF in this respect. And after a period of play-testing, it is clear the changes are detrimental to the game. The solution proposed for play-testing in ProPlus is to adjust the rocket blast based on rocket direction. Intuitively this is the most sound solution. Even though the defaults were selected after a large amount of play-testing and experimentation; the same variables used to tweak the solution have been left available for further experimentation, but will be locked at some point in the near future. Testing should be done on dedicated servers. Use of rcon to adjust values while testing is recommended. Make sure that proplus is enabled. As always, features in PK++ are open for discussion. PLEASE ENSURE YOU RETURN THE VALUES TO DEFAULTS FOR PUBLIC SERVERS – this will be locked after 0.8.1.62.
rocketfactor [number] Multiplied by the vertical velocity fraction, becomes one less than base of the rocket factor used. rocketfactororder [number] Sets the exponent of the rocket factor used. …and should be set, serverside. Rocketfactor linearly affects the base of the overall factor which is related to rocket direction, whereas rocketfactororder affects the exponent and therefore order of magnitude of the overall factor; again, as related to rocket direction. These indicate the two extremes of what has been done in PK. By qualitative analogy only, 1.35 and/or the ideal is somewhere between, where the balance of sensible effects from rocket jumping and rocket fights are matched. The defaults as set as close as possible to match this. Lowering rocketfactor will increase the amount of knockback an opponent occurs from a hit in fights. Increasing rocketfactor and/or rocketfactororder will decrease the amount of horizontal knockback you recieve from a rocket jump. A higher rocketfactororder will increase the rate of reduction of the amount of horizontal knockback you recieve from a rocket jump, as the rocket angle approaches vertically down. If you adjust the values remember that what feels good is not necessarily good for gameplay and rocket fights. The temptation is always to increase both values, letting rocket jumps improve and overall rocket fight gameplay deteriorate. Rocket jumping is a skill, and values should not make it *too* easy. The low rocketfactor keeps rocket fights sensible, with players getting horizontal knockback from rockets, as well as retaining the possibility for off-the-wall pushes. The high rocketfactororder leads to less horizontal knockback in true rocket jumps. Thanks to lioNR at al., TsN and various others for articulating the exact issues. text editor, but you edit at your own risk. automatically be generated and reloaded. until finally all possible locations are named correctly. since it will require less processing. points (which in the waypoint files are named using the loc-file location. with PK++ can always be improved on. wish to try a few times before to see what works and what doesnt. the routes available ot the bot. require some points midway up. 5. Waypoints should be included towards and on top of key items. scales/aligns the players to the image. mapview, you may do so. the FarClipDist under properties on the right panel, and/or set Fog to No Fog. is recommended, and is the example used here. \data\mapview\ with the file name the same as the required map name. channel is just a plain black image. do this make a copy of the map image using Image->Duplicate. Ensuring you are working on your duplicate image, turn it into greyscale mode..
You wish to have the areas you wish to see on the screen completely white. between +50 and +100. This will remove the majority of the grey in the map area. you can apply some blurring to the edges to soften the transparency edges. determine this until youve loaded it into PK. In the above list, the prefix of global refers to mapping the player coordinates onto the screen. globaltranslaterot is however, currently disabled. The prefix image refers purely to the mapview image and where it is located on the screen. rely on player locations alone. Spectate a game, probably a bot game is easiest, and ensure mapview is on. 5-6 are for horizontal and verical translations. incorrect and needs rotation you may need to do this. The Team Sportscast Network is extremely proud to announce coverage of the Cyberathlete Professional League’s 2005 Extreme Summer Championships taking place in Dallas, Texas from Wednesday, July 6th to Sunday, July 10th. Comprised of more than 7,300 gamers from all across the globe, this CPL event features six competitive tournaments with a combined prize total of more than $210,000 USD. It also represents the fifth stop on the $1,000,000 CPL World Tour, a worldwide Painkiller competition taking place in nine different countries throughout the course of this year. TsN is poised once again to raise the bar for competitive gaming media, utilizing new technology to provide continuous video coverage. This year will be unlike anything we have ever done before. Hunter Luisi, TsN’s CEO said. The difference between this year’s coverage and anything done previously is our transition from a ‘sports-like’ broadcast to a truly professional quality sports production. The Team Sportscast Network will again redefine the how to on live event coverage of competitive multiplayer gaming. As a part of TsN’s transformation, TsN is excited to add a whole new dimension to our unparalleled commentary and analysis by bringing you comprehensive coverage of all aspects of the Summer Championship. Featuring live interviews from the Intel sky bridge, as well as full coverage of the activities taking place during the event, TsN hopes to elevate its established reputation as the leader in competitive game broadcasting, in addition to helping advance gaming into traditional sports arenas. The Cyberathlete Extreme Summer Championships is bigger than ever with over 7,300 gamers expected to compete in the game tournament and LAN party at the new Gaylord Texan Resort in Grapevine, Texas on Wednesday, July 6 through Sunday, July 10, 2005. The $1,000,000 CPL World Tour, which will conclude with a giant showdown in November in New York City, is the largest, year-long competitive tour in the growing sport of videogame competitions. Another painkiller interview has been made by dignitas and this time it was Deatz from check-six who was the lucky one to be interviewed. So far Dignitas have made 16 spotlight interviews and you can be sure that more interesting interviews are coming up. If you missed any of the previous interviews you could find them all under the painkiller spotlight archive on their site. First of all, for how long have you been playing Painkiller? I started playing from the very first beginning, I guess it was the first alpha I played, “moerser” an I practiced directly after the release on LAN together, and we liked the game :). I think it is 1 Year ago or something like that :). The upcoming event is in Dallas (CPL’s hometown), what are your expectations there and who do you predict to be in the top 3? Like most of the events, Vo0, fatal1ty, Zyz :), but…maybe me this time ? 🙂 no just kidding :), ye I guess it will be like that.